Up at 6 after a relatively late night (for me) reading. And I think all of those chile rellenos I’ve consumed the past few months finally caught up with me, causing some fascinating reactions. It’s a bit overcast here today, but still nice. We’ve been reading about the wintery weather up north and you have our sympathy. A week from today we’ll be back home, hoping that all the snow has melted by the time we get there. 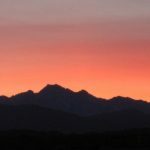 This first photo is a shot from the roof of the casa at sunset taken last night. This second photo obviously has nothing to do with I,Q 2. 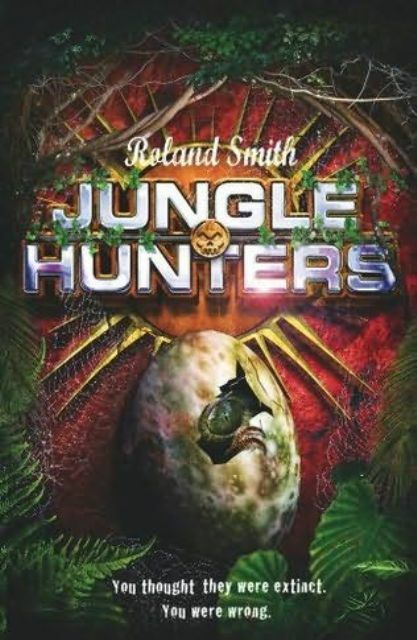 It’s the cover of the United Kingdom version of “Cryptid Hunters” which they are calling “Jungle Hunters.” It will be out “over there” in May. I love this cover. If you look closely at the dinosaur hatchling’s eye you can see the jungle reflected in it. Nice! Back to I,Q2. Someone guessed correctly yesterday that P.K. stands for President’s K id. Congratulations! P.K. is actually a character I came up with many years ago. I was thinking of writing a series of novels about him, but for various reasons the novels didn’t come about. These characters, whether they appear in books or not, tend to stick with me like old friends. I’m obviously delighted to have found a role for P.K. to play and to introduce him to you in I,Q 2. Another slight shift in this sequel is that you are going to learn a lot more about Malak (a.k.a. The Leopard). I have written her into several scene’s from her POV (point of view). She’s given up so much in order to try to take down this terrorist cell I thought it was important to give her a more visible role in this book. The SOS team also recruits a couple new members, which they badly need. One of them is an old friend of Tyron Boone’s… And both of the new characters are old friends of Malak. When I get this far along in a novel I start to think very specifically about the ending and “exactly” what steps I have to take to get there. Of course this book is not going to have a “complete” ending, because there will be an I,Q3, but there are several issues that have to be resolved and other plot points that need to be set up for Book Three. Hi Roland, the cover is awesome!! Will that book be available to purchase here? I also like that Malak will have more of a voice in I,Q2. She is such a mystery,even to Angela, I can’t wait to meet her. For now, I am waiting in my pjs with Q and Angela to meet the president. Hi Kim… S is Smithsonian will be available in stores and online April 1. We don’t sell books, we just write them. 🙂 And they get out of their PJ’s pretty quickly.